Parasailing is a safe and popular sport in which you are securely harnessed to a parachute-like canopy, known as a Parasail, and set aloft in the air. The Parasail is attached to a towrope, which is then pulled along by a boat. When the speed exceeds the stalling speed, the parasail rises, hoisting the pilot up into the air. Minimum age requirement is 10 years old, but there are weight requirements. The minimum weight is about 90 pounds and the maximum weight for a tandem (2) is 450 pounds. Each person is in the air around 8 to10 minutes. You are on the boat anywhere from a half hour to an hour depending on the number of people that are participating. We use a 600’ towline so you will get anywhere from 350’ to 400’ off the surface of the water. How many people can go at one time? 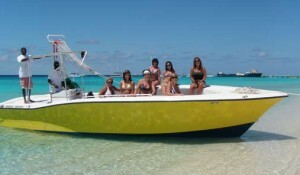 Our boat can carry 10 passengers at a time. Do you have to get wet? We utilize a system of parasailing called controlled parasailing. This system utilizes a hydraulic winch and a platform (flight deck) that is built onto the back of the parasail boat. Guests are gently lifted from the flight deck on the back of the boat and land right back on board the boat. It is the safest, most modern method of parasailing available. You do not have to get wet if you do not want to, but a fun part of the ride is towards the end when the captain can slow the boat down and touch your toes in the water. Were do we meet you? As you enter the Cruise Center stay to your left towards the Margaritaville complex and right before the Margaritaville enterance go left to the beach, walk down the beach to the right 150 yards and you will see the White Sands Resort resturant and pool. Find the blue and yellow GT Watersports sign right after the vollyball net, that is our checkin booth. It is good to wear a swimsuit if you choose to get a little wet. Also a towel, your pre-paid boarding pass (if you received one) or form of payment and money for souvenirs (t-shirts, hats & video packages). Don’t forget to wear sunscreen! We have a 24-hour cancellation policy for a full refund. “No-Shows” and reservations canceled less then 24 hours will be charged 100% of the fee. Sorry, our boat is no longer in service.